Sub-Zero Wolf has set the current standards for refrigerators, freezers, ice-machines, and wine storage. Reliable, precise products all come with a sleek design and superior quality. Sub-Zero Wolf is an investment to keep your food and wine fresher and more flavorful for longer than any other brand. Sub-Zero Wolf’s 36" BUILT-IN REFRIGERATOR delivers an impressive 23.3 cu. ft. of well-organized refrigerator storage-likely at least 50% more than you have now. Pair it with its partner, the Sub-Zero 36" All Freezer, and you'll have flavorful food on hand no matter how large your family or how often you entertain. NASA-inspired air purification scrubs the air of ethylene gas that hastens food spoilage, and also reduces odors by removing bacteria, mold and viruses. A magnetic door seal system locks in cold, while a state-of-the-art micro-processor precisely controls temperatures. Crisper and deli drawers form a lower-temperature zone ideal for produce and meat. At last, you can have exactly the kind of refrigeration you've wished for. Sub-Zero Wolf’s 30" M SERIES TRANSITIONAL BUILT-IN SINGLE OVEN's cooking modes are precise, intuitive, to ensure that the meal you bring to the table is every bit as delicious as the meal you had in mind. A Gourmet feature has a menu of presets that automatically controls the cooking, making commonly prepared meals quick and easy. Its unique digital technology senses the amount and size of the food, and automatically adjusts all the details of cooking. A stale baguette is rejuvenated to just-baked freshness. French fries are "fried" without a drop of added fat. Crisp, hot phyllo pastry is baked around firmly frozen ice cream. Sub-Zero Wolf 48" Pro Wall Chimeny Hood's bright halogen lighting with multiple settings illuminates the cooking surface. Stainless steel baffle filters remove easily and can be cleaned in the dishwasher. Heat sentry features automatically turn the blower on or increases speed when exhaust temperature exceeds 200° F. Whether you're stir frying or simply scrambling eggs, blower control adjusts for just the right amount of ventilation. At Guy Gunter Home, Living Well means a luxury approach the common, everyday experiences. Scroll down to see elegant recipes and more! 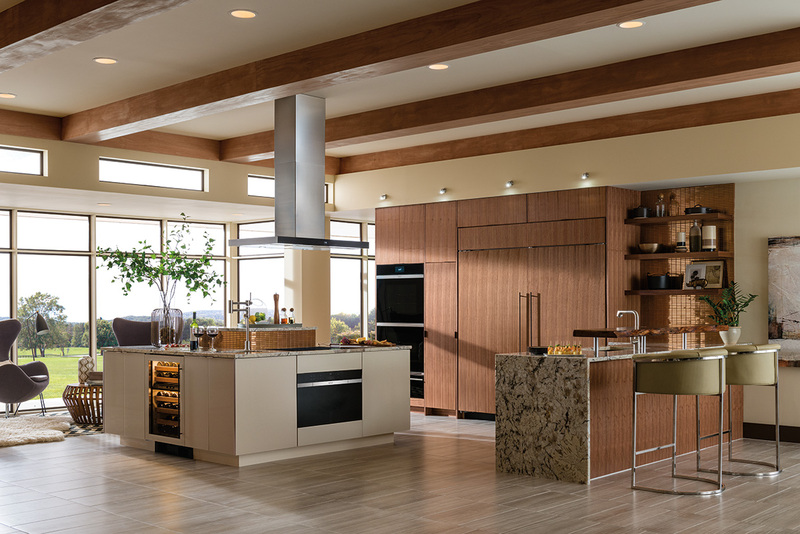 Click on more to see luxury kitchen appliances that help you create this wonderful cuisine in the comfort of your own home. Guy Gunter Home brings Sub-Zero Wolf to luxury homes all over Metro Atlanta. Come to our West Midtown Atlanta Showroom to see products from Sub-Zero Wolf and more.